Having taken a few trips around the sun, you sometimes get to notice some patterns about life and people. For example, I have never had a bad time when I have been with some one named “Bob”. In fact, I can honestly say that I have been had the good fortune to have been mentored by two amazing men, Robert “Bob” Teideman of Newport antique twelve’s fame and the late Dr. Robert “Bob” Schwartzand the racing yacht “Diane” crew. In fact it was just the other day that another partner in crime who to this day has the nickname “Doctor” due to his altruistic and heroic efforts, invited me for a retreat up the coast in Powell River. May be it is the buoyancy factor, you can count on a “Bob” to float your through the rough stuff. “Bobs” ride the waves and shuck and juke with the punches. So after spending three hours getting introduced to the game of stand up water polo, I wasn’t surprised to discover that there was a Bob behind this fantastic and lunatic event. Now that I paddle every Monday at Deep Cove, I have come to realize how much is actually going on. Besides, the rental program of SUP’s and Kayak’s there is a flow of amazing athletes participating in other paddling events coming to the cove to share both their enthusiasm and wisdom. As I was leaving the Cove on Monday, one of the staff mentioned the Wednesday evening sup water polo. I had never heard of such a thing and I have only been on a board since April but I figured in a moment of both ignorance and confidence….”what the heck, what do I have to lose?”. So I arrived at the Cove early and noticed among the many floating things in the harbor thee was this this odd floating structure near to the shore. The bay was a hive of activity. There were kayakers, sailboards, two person paddle boards and I wondered if I was in the middle of a Doctor Suess poem..”there were paddlers with fins and paddlers with grins, there were even worldly wise four footed paddlers with wiskers on their chins”. The original board and ball polo 1941! As I sat upon a bench and proceeded to watch a pack of young pups proceeded to spin and shoot within the floating pontoons, I distinctly could not help but notice a high level of skill. It was like watching a pack of grommets play in the waves in Monterey. I began to seriously doubt my choice to play. The game itself involves two teams of three players standing upon larger more buoyant paddle boards. These board are coloured red or blue so that when you are in the water half drowning, you can identify which board is yours. The paddle is a combination of a spoon surface with an open hole. This means you can paddle hard and go no h and at the same time attempt to scoop a ball up into your stick without falling overboard. You are allowed to make stick to stick contact and ram inflatable rubber paddle board into the other team players boat causing a player to be out of the game in the water and hopefully not you. The game does involve a lot of falling into the water, swimming and climbing onto your board and standing up again. All this considered and with no experience I decided to my name on a list and was told that not a lot of folks were coming. So I relaxed, became a “free agent”, and patiently waited fully aware that I did have a good excuse. “How did you trip to go play polo go?”..”Oh I was a free agent and there were not enough players. I found an empty space on the seawall, smiled and felt reprieved. Oh well, I can just watch the kids, inflate Clarity and go of for a nice solo paddle. As the first game began, I was just part of the growing crowd watching first game in the middle of the bay. Unlike the film clips on-line, there was a lot of speed and feisty play. There were no end of folks falling into the water and popping up onto their boards as if there were sharks in the water. This game was fast. I sipped a beverage and grinned and felt the quiet satisfaction of being just another on looker. That is when I heard my name being shouted. The first time I ignored it. From the shore, a young man was calling me out. Everyone was looking at each other. I actually thought of just ignoring his shouting when some one said..”we cannot find him”. I took in the scene wondering if my invisible powers would work. There was more head turning and a crew of fit folk patiently waited on a massive inflatable sup. Ignorance kicked in and I decided to get my wet suit vest and saddle up. I had made this mistake once before in a gymkanna where I nearly speared my horse racing around a pylon. Yup I decided to giddy up and joined my team “the free agents”. As I wobbled and fell into the water prior to the first game, I noticed a familiar face staring back at me from the other team. It was my first instructor that took me out on my first ride on a soggy April day. There he was, big grin and massive thighs giving me a shacka salute. Yo bra and the game began. I remember being either airborne or in the water. There was a lot of cheering and laughter. Why I felt an odd sense of confidence I did not know but this was really fun. The game went on for eight to ten minutes. Neither I nor the many others had the time to even contemplate the time. It was like crash test dumbies all set loose to see who could stay afloat and move the ball. Two players on the other team were spinning their boards like they were bailing out of riding waves. I was learning to bend down more and attempting to move my feet. Having coached a few field sports, I looked for open space and attempted to pass the ball prior to falling overboard. I was on a learning curve with bald tires and a slippery soggy surface. The free agents put up a great fight, we even the lead for some of our games and even attempted to give high fives without falling overboard. As the tide rose, a whole group of players and staff moved the pontoons closer to the shore so that more folks could watch. As the sun was sneaking it’s way to the horizon, I began to notice that many of the players were visiting paddlers and ex surfers. This would explain why and how they could jump in the air and spin to face the other direction. There were both guys and girls laughing it up with each capsize and goal. On the sideline we began to form a cheering section and did shark bit salutes as both young and more crafty older players went head to head. The boys started shouting out for Bob as I watched wiser wizard cherry picking close to the net. While brawn could get to the ball faster, the worldly-wise experience brain came up with neat tricks to score and sink other team players. Being the last of the free agents to remain, I was pick up by one team and we managed, with the help of David’s crazy board and football skills to form a three-step ball movement to a young whippet who won the game. Then I got picked up by another team and as the video cameras rolled, I was now in the semi final game. Here is was.. the Cinderella story, a misfit from Vancouver, now playing goal against the grommets who for the last I had admired that afternoon. Could it be a Disney film..the outlandish saves, the long distance shot, the roar of the crowd? Within the first opening five minutes and from behind me, a board made contact with mine as I saw the ball being relayed towards me. When I resurfaced from under the water, ball was in reach of their forward player who casually flipped the ball into the air and then netted the ball with his stick. I laughed, looked for my paddle board and beaked at the shooter…”really, you had to do that!”. The grommets were out for blood and soon I was viewing the finals from the sidelines, I got to witness the grommets take on the paddling rock stars from South Africa and mighty Australian and “Bob”. This is the game the Grommets had been waiting for. “We want to play Bob”, they had been chanting from the sidelines. The afternoon practice was showing great skill for the pups but a cunning South African continued to show amazing goal keeping skills. Bob snuck in under the radar and cherry picked an equalizing goal. The grommets complained about score keeping as I raised my arms to show two peace signs but the afternoons practice paid off with a final score of 3-2. 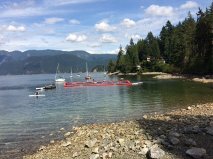 For more fact about Bob…and Deep Cove events please use the following links or go to my page “what is sup in Vancouver”. Now there is an “attaboy endeavours” facebook too! I am in training now and preparing for a rematch! It appears that Deep Cove Days may be the next set of games!